*This post is being sponsored by ThimbleCakes. All opinions are mine and mine alone. Showers and I have a complicated history. But before you go thinking that I prefer being stinky to bathing what I mean is that I’ve always been slightly uncomfortable with the concept and execution of wedding and baby showers. I am a sucker for sentiment but have never felt comfortable when things are overly commercialized. And I saw baby and wedding showers as primarily gift-giving events. History supported that belief. 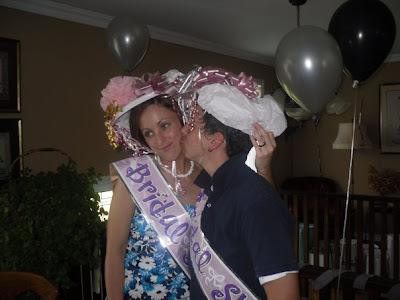 In the late 1800’s bridal showers are said to have grown out of dowry practices. If a woman’s family was unable, or unwilling, to produce a dowry then friends would bring her gifts that would compensate for her misfortune and enable her to marry. 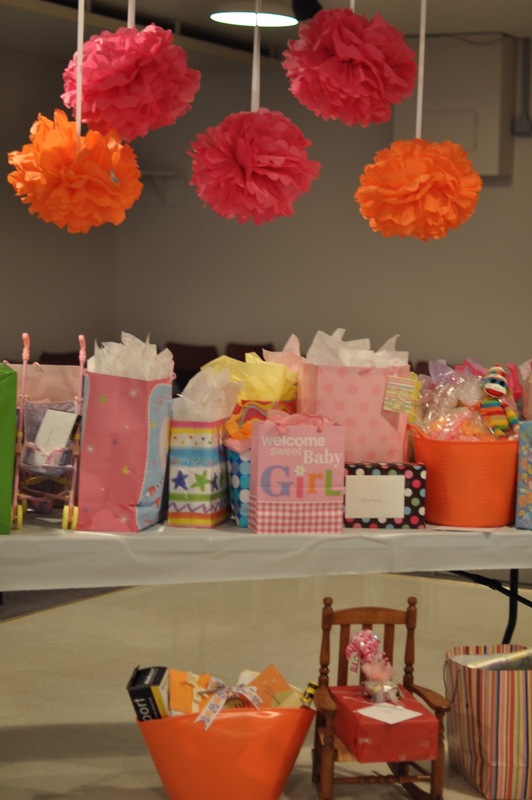 Although gift-giving for new babies has a long history, the modern baby shower developed in North America after WWII during the baby boom era. It came at a time when consumerist ideals were flourishing and served to provide the new mother with purchased things that were not only designed to make infant care easier but also seemed to construct the woman’s primary (and nearly exclusive) identity as a mother. So when my own wedding approached I eagerly told those who would listen that I wasn’t interested in a shower. In addition to the reasons stated above I have also never been a particularly good liar and I was afraid of getting gifts that weren’t my style and having to feign enthusiasm. Our friend Tammy (Mac’s auntie Tata) ignored me and listened to my wife-to-be and I am so grateful that she did. We were welcomed into matrimony by many of the women in our lives who loved and supported us. 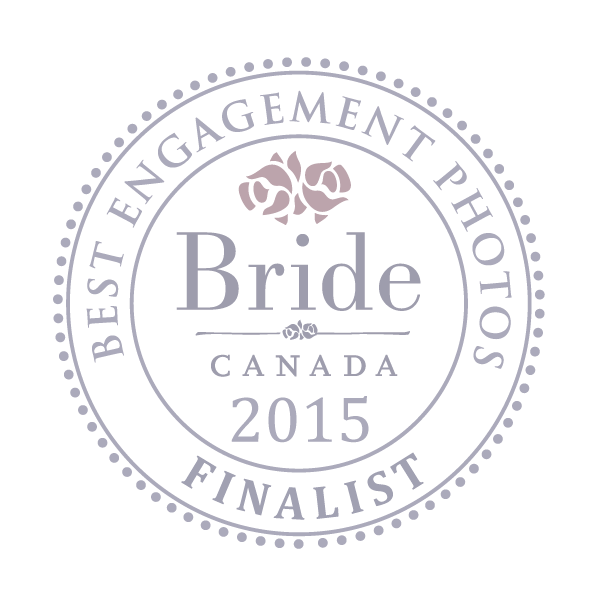 The silly games, the finger sandwiches, the balloons, all seemed to validate something that I never thought needed validating. Opening gifts in front of a large group of people was awkward. Particularly when Tracy’s aunt gave us a wedding album that had the names Herb and Beverley monogrammed on the front and room for “grooms military record” and “groom’s education” inside. It was clearly a garage sale find. And I was unsuccessful at holding back tears when my grandmother gave us matching sterling silver charm bracelets with our initials, the date of our wedding, and the lesbian pride symbol. The day was overwhelming and we were very honoured. As we prepared for Mac’s arrival we had a similar experience with his baby showers (yes! We had two!). Mac’s auntie Tata poured her heart and soul into a NY themed shower that brought together friends and family who surrounded us with love and support. And my mother hosted a second shower that did much of the same, while also rooting Mac’s presence in the town that raised his Mama. We were spoiled with gifts that we appreciated beyond measure but it truly wasn’t about the gifts. It wasn’t about constructing our identities as mothers through the consumption of gadgets and coloured plastic. It was about being supported by family and friends who were welcoming us into the grand world of parenting and confirming that our son would be born into a village of loving adults ready to support his growth. 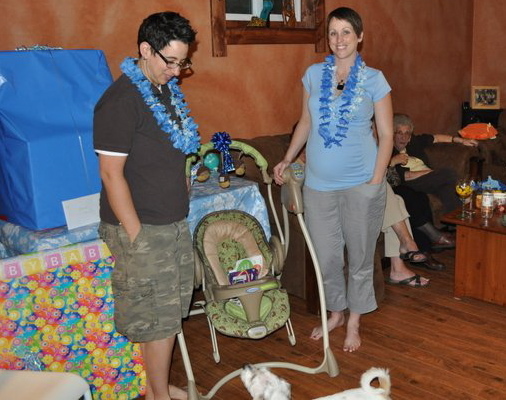 With all of that in mind, we prepared recently to co-host a shower for Mac’s aunties Valerie and Marty. 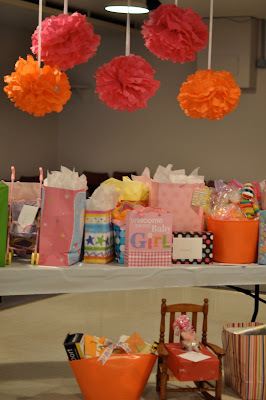 Along with Valerie’s sister, sister-in-law and a few close friends we planned an event that would hopefully let the moms-to-be know what was in our hearts. Each part of the planning committee utilized her own special talents that worked as complimentary puzzle pieces operating in unison to organize an event that would show the moms that their baby girl would be born into a village that would help to raise her up into the intelligent, confident and miraculous woman she is meant to be. Some of my early criticisms of showers had to do with wasteful spending and an obsession with details of which I had yet to understand the value. Did it matter that pom-poms were cut out of pink and orange tissue paper and hung to the ceiling? Did it matter that the tables were adorned with coordinating covers and centre-pieces? 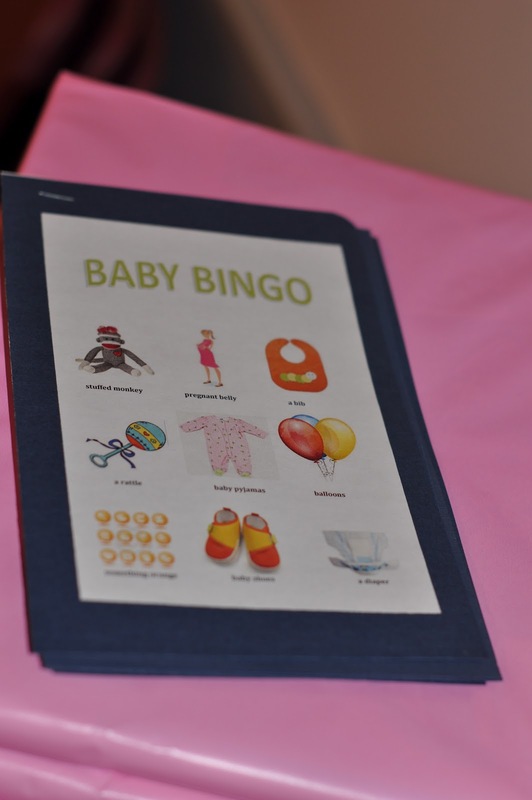 Did it matter that the kids were entertained with bingo, scavenger hunts and prizes? Did it matter that miniature postcards from Paris were ordered off of Ebay and that friends and family were encouraged to offer the new moms words of encouragement from their experiences as parents? Did it matter that there was a table filled with gifts that ranged from practical to heart-warmingly-sentimental? And did it matter that at the centre of the food table sat a beautiful two-tiered cake that the moms got to cut with all of the emotion usually reserved for a couple at their wedding? 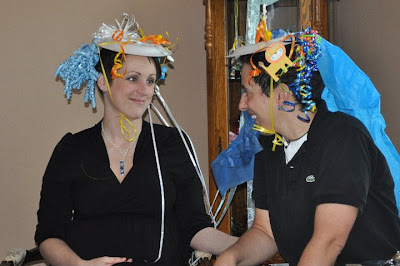 Of course we could have pulled off a love-filled shower without any of those details. But each one acted as an important ingredient in a recipe of love and community building. They matter because Valerie and Marty matter. And because baby Gabi matters more to the people in her moms’ lives than she will probably ever know. That cake is adorable :) your friends look so happy :). Also I love your cab cookies!! 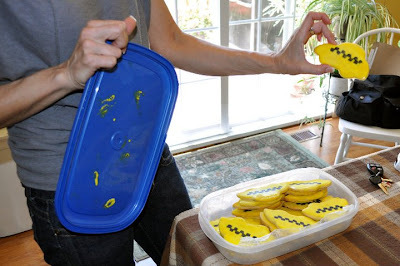 And yes, Tammy makes an awesome cab cookie. that's the perfect outlook Rianne! What a beautiful post! I love the decor! And the cake!!! How beautiful! I'm so glad that you had that Leslie. You, Abby and the whole family so deserve a celebration! Loving the cake! You shower seemed so wonderful and cute! I've always looked at showers as a way to shower a couple with love. You certainly did that. You never told us what flavour that cake was ... did it taste as good as it looked? It certainly did! One tier was chocolate and one vanilla. Moist and delicious. We *may* have also indulged in a few cupcakes on our way out of the store... I've been thinking of that Latte Cupcake ever since. P.S. that quilt was SOOOOO adorable. 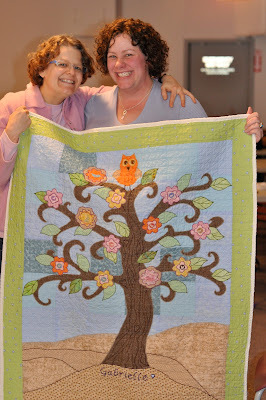 I have huge envy for women who can quilt! What a beautiful shower you guys threw Kris! All the little details are so sweet! I love the decor, and the cake looked amazingly yummy! Beautiful as always Kris! Love the decor and the stuff to keep the little ones busy! What a gorgeous cake! A wonderful reminder that a family is more than just blood...it's a community of love! Beautiful Kris! The shower looks like it was amazing! I love the picture of the Moms-to-be cutting the cake! It looks delish! 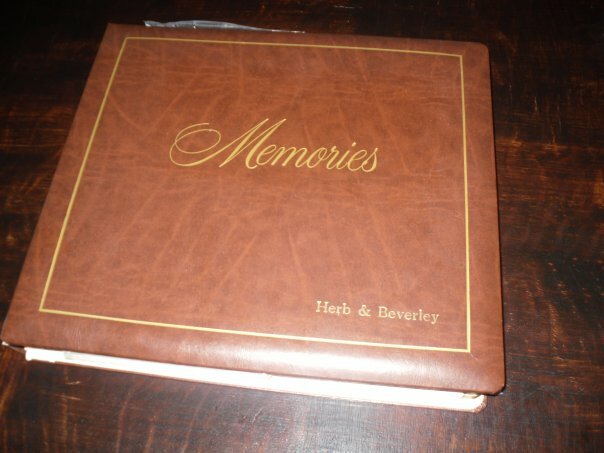 ah yes, Herb and Beverly. I almost forgot too until I started thinking about showers. I love the quilt! 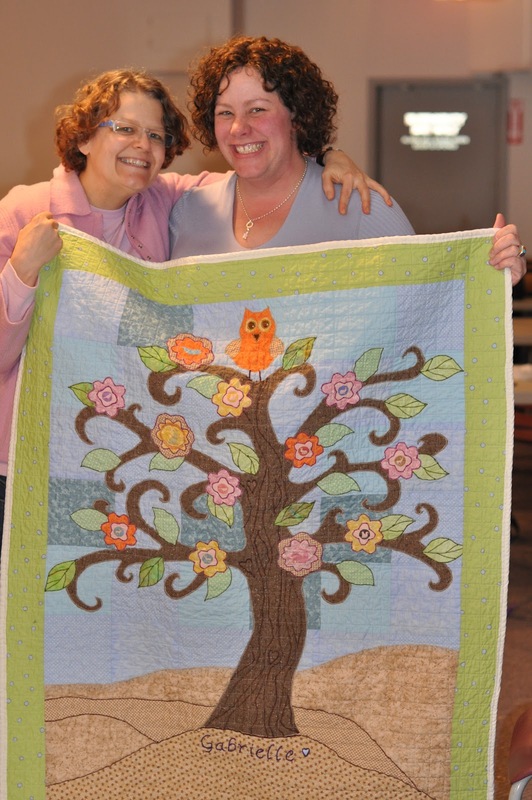 We also got a hand made quilt at Roquelle's shower and it's something that I will keep forever. And I'll never get tired of LOLing at Herb and Beverley! I also enjoy laughing at Herb and Beverly...but seriously Kris it looks like everyone worked hard to make an awesome day for the mom's to be...everything looked fantastic and the cake looked fantastic and delicious!!! I really dreaded my own showers (hated that awkward feeling of having all eyes on you as you open a million presents and having to come up with clever things to say after every gift), but I love attending other people's showers, and I love love love blog posts about showers. Not sure why, but they're my absolute fave! Looks like you guys did a great job creating a special and memorable shower for your friends. I loved the Postcards from Parenthood idea! I think every baby deserves to be celebrated (and the mommy's too!) I have six kids and had a shower for every last one! I am a firm believer in ritual and our society lacks big time especially if you are not a part of a church/religion. I have been conducting (??) welcoming/naming ceremonies and Blessingways for expectant mothers for years and now I have the privilege of marrying people. We definitely need these celebrations to affirm that we are supported and loved. I agree, some showers lack in lustre but Val and Marty's shower was so wonderful and fun and you could feel the love from everyone. Great job!! This was such a sweet post. 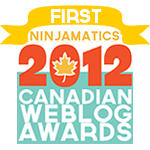 A friend of mine recommended your blog and I have just spent the last two hours glued to my monitor. You are so blessed to be a part of such a loving community. I tried a gluten free cupcake from Thimble Cakes a few months ago but it had been sitting on a friends counter for who knows how long. You have inspired me to try another one.